Of the many artists during the twentieth century that chose to paint the small Scottish island of Iona, Francis Campbell Boileau Cadell became one of the most celebrated. 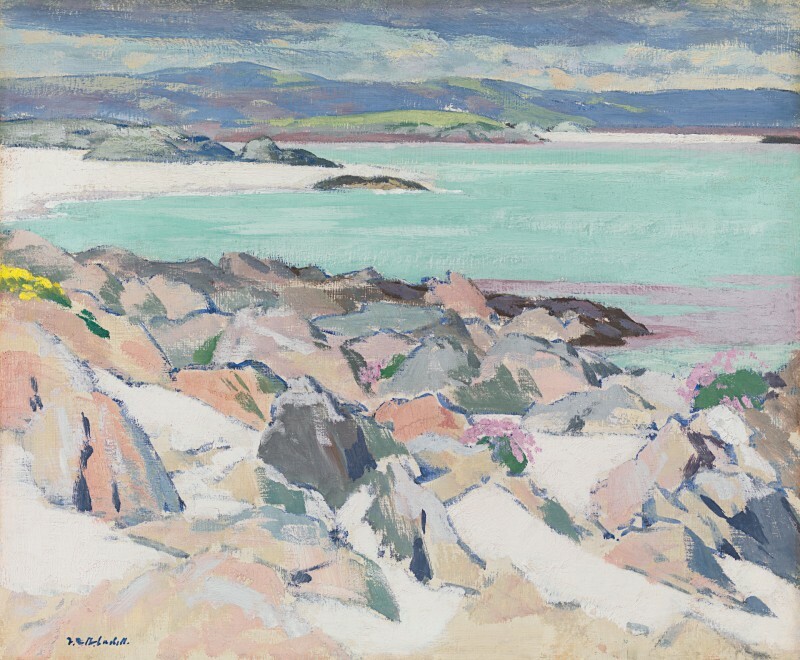 After Cadell’s first visit in 1912, he returned to Iona most summers and it is clear from his extensive studies of the landscape that Iona had a profound effect on him. In 1920 Cadell invited his fellow artist and close friend Samuel John Peploe; they became the only members of the Scottish Colourists to paint on Iona and returned frequently. Their renderings of the island’s landscape represent not only exceptional works of art, ‘but also comprise an interesting historical recording’ of the island, explored by Philip MacLeod Coupe in his book Paintings of Iona, Cadell and Peploe. Flamboyant, eccentric and witty, Francis Campbell Boileau Cadell was one of the Four Scottish Colourists. Born into a prosperous Edinburgh family, he was encouraged to train as a painter by Arthur Melville (1855-1904), a leading member of the Glasgow School. He attended the Royal Scottish Academy School from 1897 – 1899 and spent the following eight years in Paris, where he studied at the Académie Julian from 1898 – 1902. Whilst in Paris, Cadell was inspired by a number of influences including the Impressionists, Henri Matisse and the Fauves. He also visited the great Paul Cézanne and Vincent Van Gogh exhibitions. Perhaps the greatest influence during this period was James Abbott McNeil Whistler, whose Memorial Exhibition he saw at the Luxembourg in 1905. Cadell moved to Germany with his family in 1906 and enrolled at the Academie der Bildenden Künste in Munich the following year. He returned to Edinburgh in 1908 and held his first one-man exhibition at Doig, Wilson & Wheatley. The following year he made a trip to Venice, financed by Sir Patrick Ford, who became one of his most important patrons. During the First World War he served as a Private in the 9th Battalion, The Royal Scots and then obtained a commission as 2nd Lieutenant in the 5th Battalion of the Argyll and Sutherland Highlanders. After the war, Cadell adopted a new intensity of colour and the use of thickly applied paint. This stylistic development is most evident in his pictures of Edinburgh interiors, which, with their flat areas of boldly juxtaposed colours, reveal most clearly the influence of the Fauves and Matisse. From about 1913 until his health began to deteriorate in 1935, Cadell made Iona his second home. He acquired a croft and visited the island annually in order to paint the landscape out of doors. Many of these landscapes were painted over a wet white ground and this technique resulted in a luminosity and brilliance of colour, one of the most striking features of his work. Cadell was a founder and life-long member of the Society of Eight from its inception in 1912. He was elected a member of the Royal Scottish Society of Painters in Watercolours in 1935 and was made a Royal Scottish Academician in 1936, one year prior to his death. The work of Francis Campbell Boileau Cadell is represented in Aberdeen Art Gallery & Museums; Gracefield Arts Centre, Dumfries and Galloway; Dumfries Museum and Camera Obscura; Lillie Art Gallery, East Dunbartonshire; University of Dundee; Dundee Art Galleries and Museums; Scottish National Gallery of Modern Art, University of Edinburgh, City of Edinburgh Council, Royal Scottish Academy of Art & Architecture (RSA), Edinburgh; Kirkcaldy Galleries, Fife; Kelvingrove Art Gallery and Museum, the Hunterian Art Gallery, University of Glasgow; McLean Museum and Art Gallery, Inverclyde; Paisley Museum and Art Galleries, Renfrewshire; Perth & Kinross Council; Hawick Museum, Scottish Borders Council; The National Trust for Scotland; Touchstones, Rochdale; The Potteries Museum & Art Gallery, Stoke; Brighton and Hove Museums; Doncaster Museum & Art Gallery; Ferens Art Gallery, Hull; Walker Art Gallery, Liverpool; Manchester City Galleries; Museums Sheffield and The Fleming Collection, London. TJ Honeyman, Three Scottish Colourists, Thomas Nelson and Sons, London, 1950, p.90.